American Audio Q-D1 MKII Pro Preamp Mixer DJParts - All Variety of Parts that DJ Needs. 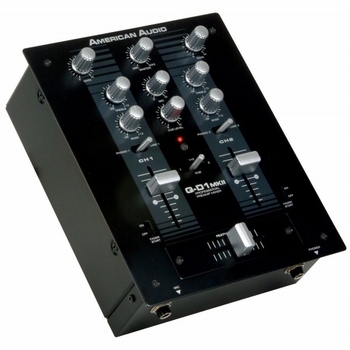 • 2 Phono, 2 Line, 1 Mic input • Fader “Q” Start (crossfade directly to a pre-programmed cue point when used with an American Audio Q Series Mixer) • Gain, treble & bass control for each channel • Master, Microphone & Cue level volume control • Cue monitoring between channels • 1/4” jacks for Mic & Phono input • 9V AC power supply included • Dimension (LxWxH): 9.5” x 7.5” x 4” / 236 x192x105mm • Weight: 4lbs. 2 kgs.